This dish is so simple and easy yet tasty beyond belief. It has it all – chewy, crunchy, savoury, sweet and loaded with nutrients to fuel you through the day. It’s also one of my favourite lunches to tote to work. Rinse and cook the quinoa in 2 cups of water. When the quinoa is cooked, fluff it with a fork and let it cool. You can do this step ahead of time – even the day before. Toss all the ingredients together in a large bowl. I like to let the dish sit for an hour in the fridge to let the flavours blend before serving. *I have a coconut balsamic vinegar that I used in this recipe. If you’re into flavoured vinegars, this is a great dish to experiment with some of the different flavours. So this happened in my kitchen the other night. Someone had told me, quite definitively, that quesadillas must have cheese and could not have beans. “Oh yeah,” I thought to myself. Let’s see about that. I created a stack of beany, cheesy, creamy quesadillas and baked them all together. Black beans and sweet potato give the dish an incredible creaminess. The result is , if not authentically Mexican, still a fiesta in your mouth! Wash but do not peel the sweet potato. Dice it and either microwave it or bake it until it’s soft. If you’re baking it – 350F for about 15 minutes. Set aside. Mix the milk and the salsa together and set aside. In a large saucepan, heat the olive oil. Add the onion, garlic and red pepper and saute until the onion is softened. Add the chili powder, cumin, basil and oregano and heat through. Add the chipotle adobo sauce or jalapeno if using and heat through. Switch off heat. Add the beans, sweet potato, spinach and cilantro and mix together. Oil a 9” pie plate or other casserole dish. If you’re not using a round dish, you will have to cut the tortillas to fit the dish. Line the bottom with one of the tortillas. Add half of the black bean mixture. Sprinkle with 1/3 cup cheese. Spoon 1/3 of the salsa/milk mixture over top. Repeat with another tortilla, the remaining bean mixture, 1/3 cup of the cheese and 1/3 of the salsa/milk mixture. Place the last tortilla on top. Pour the remaining salsa/milk mixture over then the remaining cheese. Bake at 350F for 30 minutes. Let the dish stand for a few minutes before cutting and serving. Enjoy! 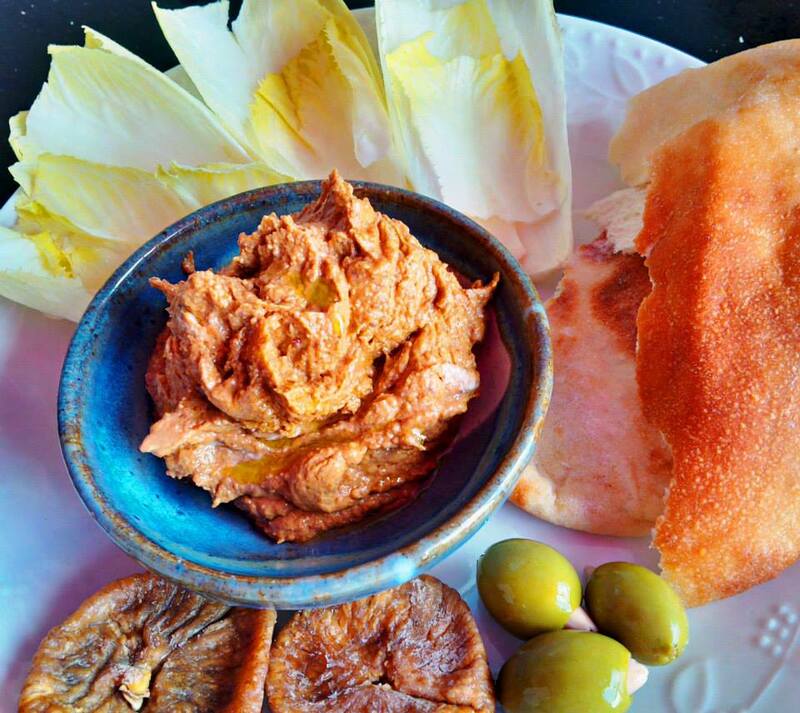 Move over hummus and make room for muhummara – a savory, almost meaty dip with a slightly sweet tang that makes it gorgeous to eat on endive leaves.. This dish does require a bit of planning. The peppers need time to roast and cool. 2 ½ Tbsp pomegranate molasses (find it in the foreign food section of larger supermarkets or in markets specializing in Middle Eastern and/or Halal foods). ¼ cup tomato paste (TIP: buy a large can of tomato paste and dole it out into 2-tablespoon portions onto a wax paper-lined cookie sheet. Place it in the freezer and let the tomato paste dollops freeze ’til solid. Store the frozen dollops in a container and you’ll have tomato paste when you need it with no waste. I/4 cup is 4 tablespoons). To toast the walnuts: Do this either in a dry frying pan on high heat, shaking constantly because the walnuts will burn in a flash. I prefer to toast my nuts and seeds in a toaster oven at 430F for 5 minutes. To roast the peppers: remove the stems, cut the peppers in half lengthwise and remove the seeds. Place the peppers cut side down on a cookie sheet and roast at 450 for 10-15 minutes. They should be charred on the outside. Place the still-hot peppers in a paper bag. Roll the bag’s rim to seal it and let the peppers steam. When they’ve cooled down, their charred skins will slide right off. Gosh, doesn’t that sound so evil? Once you have toasted walnuts and roasted peppers, everything comes together in mere minutes. Put all the ingredients in a food processor and blend on high until you have a thick dip. You may need to scrape down the sides of the food processor bowl once or twice. You can enjoy the dip immediately or store in the fridge for up to 3 days. I find the muhummara is even better the next day. Enjoy with endive leaves or crackers or pita bread. SO GOOD and something a little different!